From Atkins to Dukan, fear of the almighty carb has taken over the diet industry for the past few decades-even the mere mention of a starch-heavy food is enough to trigger an avalanche of shame and longing. But the truth is, carbs are not the enemy. 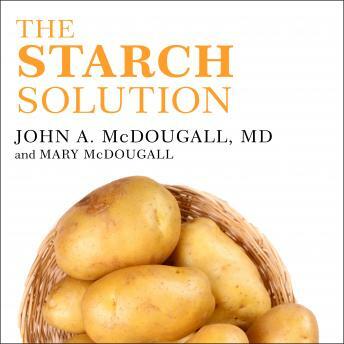 Now, bestselling author John A. McDougall, MD, and his kitchen-savvy wife, Mary, prove that a starch-rich diet can actually help us lose weight, prevent a variety of ills, and even cure common diseases. By fueling the body primarily with carbohydrates rather than proteins and fats, listeners will feel satisfied, boost energy, and look and feel their best. Including a 7-Day Sure-Start Plan, helpful weekly menu planner, and nearly 100 delicious, affordable recipes, The Starch Solution is a groundbreaking program that will help listeners shed pounds, improve their health, save money, and change their lives. Starch Solution: Eat the Foods You Love, Regain Your Health, and Lose the Weight for Good!